Does this refer the US version only or also to these books printed in Europe? It is now a rare collectors edition! Wondering of the snafu will be corrected for future copies? I sure hope somebody recorded it. If it pops up on Dime I'll send the FLACs to you. More Blood More Tracks is a treasure chest! The original is probably my fave Dylan record. Looking forward to exploring this. Thats fine, although it wouldn't kill him to say thank you or talk about a song or something. Again, I'm fine if he doesn't, but he used to be so good at it at shows. Its weird when it just disappeared. After a 6-hours marathon listening to this box-set, starting last Tuesday and just finishing it, I can say that this is a fantastic collection and certainly my favorite of all the Bootleg Series releases. And he said that almost 30-years ago. Based on Desert Trip, IMO, he nor the his songs are doing much talking anymore. Maybe old Bob needs to fade off into the sunset. 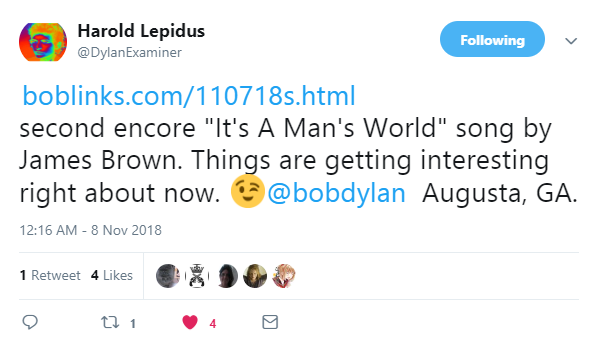 regarding post i fat fingered above: Bob's response to people saying that BOTT is their favorite Dylan: "So much pain..."
I hope somebody recorded this. I'm slowly making my way through More Blood More Tracks. Put it on an iTunes playlist, put all the songs together in order of their takes, and am trying to listen to a progression of one of the 13 different tracks each day. First day was Spanish Is The Loving Tongue. Easy, only one take on the whole box! Next was Lily Rosemary And The Jack Of Hearts. Had heard the acoustic version before but still so damn good. What a song in general. One of the ultimate "how does he remember the words?!" Next was Call Letter Blues. After that was If You See Her, Say Hello. That first take was ethereal. Just amazing. 9 more to go through! Wow...what a great cover...suits him well both lyrically and musically. On YouTube there is a great live performance of James Brown singing a duet of it’s a mans world along with Pavarotti. Savannah GA ----> Johnny Mercer ----> lyrics of "Moon River". Edited 1 time(s). Last edit at 2018-11-10 23:12 by dcba. How does he even get more remarkable all the time? have such enormously different 'sounds' and vocal approaches. It sounds like the audience was super appreciative of what he's putting down. about it here, thank you. Any news of Dylan's Malibu home? He's not at home of course...on his Never Ending tour. Not that much news in the UK media of the California fires which I find surprising. I read though that Neil Young's home has been destroyed. Second time its happened to him. An area called Paradise has been wiped out. Paradise is up in Northern California - initial reports said 100% destroyed now revised 90% destroyed...devastating. As for down here, some freeways reopened last night, some evacuations have been lifted, and things seem to be settling down quite a bit. Far from back to normal though with high winds still coming and going, any lingering embers can reignite at any time. Here's a link to various videos posted by those in the thick of it: FIRE Clip posted by majaleyehonariyeparis shows how ferocious and out of control these fires can be. And this frightening one I just posted in the weather thread. EDIT: Just as I was posting the above, another new fire has broken out in Simi Valley apprx. 30 miles east of where I am on the coast in Ventura. Watching live on TV as helicopters dropping water and trying to get a handle on it...spreading very fast...rugged mountains though lots of homes in the nearby vicinity. Edited 1 time(s). Last edit at 2018-11-12 20:53 by Hairball. Thanks Hairball for your report. Our thoughts are with you, your family and all the citizens in California. I've used that method a few times, including for Dylan. Good strategy. Enjoy! 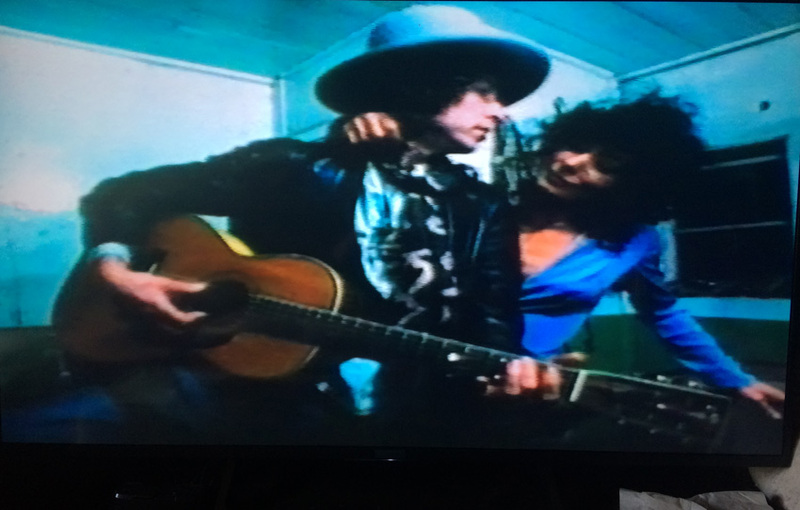 When I watched Dylan in Rome earlier this year there were people who were removed from the venue for using a camera they were given one chance and then if they ignored that they were ejected. At every Dylan show I have ever been to they have always stated strictly no photography.